'Citation Scanner' offers you a quick and easy way to find hundreds of local citation opportunities, for yourself, your clients and your prospects. This is the perfect tool to help you get new local SEO clients. 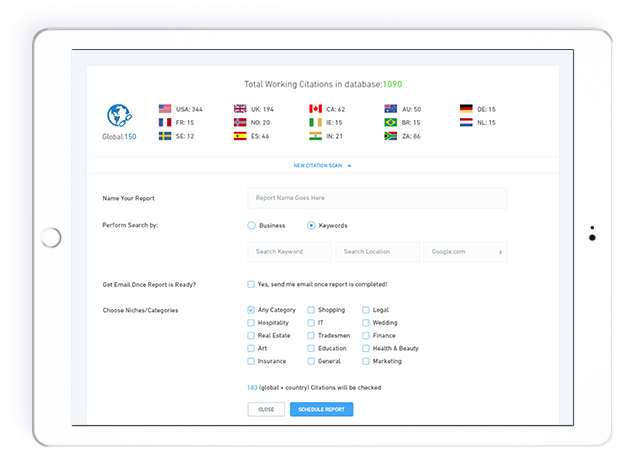 In short, 'Citation Scanner' scans local citation sources, finds out where your business is already listed, and where it isn't, and shows you hundreds of local citation opportunities, so you can create new listings and increase your local rankings. Searching for local citation opportunities yourself would take you days of tedious work. With our tool, you will be able to see where any local business is listed, and where it isn't, in just a few clicks. If you run an SEO business, chances are several of your clients are local businesses, who could do with better local rankings... Well, 'Citation Scanner' will help you get the extra local citations they need to rank higher locally. Now imagine showing up to a meeting with a potential client with a huge list of local citation opportunities... What would their reaction be? You've pretty much done all the work already. All you need to do now is lend them your pen to sign the contract. 'Citation Scanner' could be a real game changer for you!